The district between Hollands Spoor station and the Rijswijkseplein traffic intersection has been the scene of wholesale regeneration since 1985. In an initial phase, the area between Stationsplein and Hoefkade was modernized with housing by Mecanoo, DAK and Van Herk & De Kleijn. 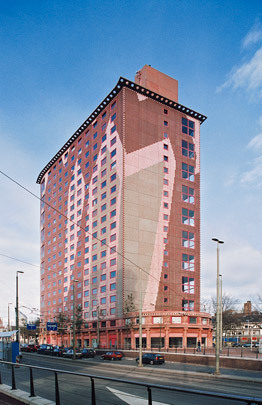 Carel Weeber for his part designed a tower block of student housing on Rijswijkseplein. Typically for Weeber, the tile pattern designed by artist Peter Struycken was slagged by the local amenities authority and made way for a less ‘busy’ variant. The pattern is inspired by the fire station that used to stand here.